Gabriel Voisin was an eccentric genius. A brilliant engineer, he walked his own road through the twentieth century, being in on the birth of aviation and building magnificent classic cars in the twenties and thirties. His company Aeromechanique was taken over by engine builders Gnome and Rhone during the turbulent 40's. He designed a very minimalist vehicle using all of his skill and knowledge of aircraft construction. Its Motor Show debut resulted in over 1,000 orders being taken, but Voisin was in conflict over the project with the G&R directors. Gnome & Rhone built 16 examples in the summer of 1949. In October 1950 it was redesigned to include low body sides, and in 1951 got a larger 197 cc Villiers engine. This unique car has a very special cabrio bodywork with circular doors. 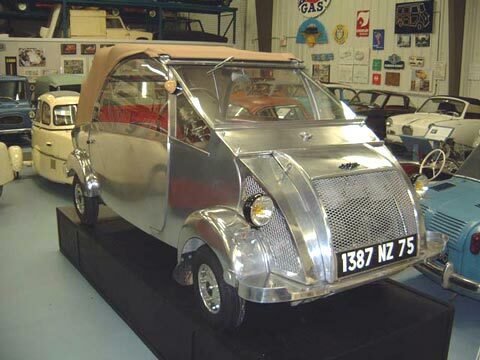 It was built as a special four-seater, according to the blueprint for the car on view in the museum. Voisin sold the license in June 1953 to the manufacturer Autonacional SA in Barcelona, who renamed it Biscuter and went on to build 20,000 examples. This unique car has a very special cabrio bodywork with circular doors. It was built as a special four-seater, possibly as a prototype in 1957, although technically a C-31, this particular car was never mass produced. Weight: 240 kg Electrics: 12 v Wheels: 4.00 x 8"